My Grandaddy loved stews and soups and this Ground Beef Stew was one of his favorites. He had a special bowl that he liked to eat stew out of and Grandmama always served him in that bowl. I do much the same thing with my coffee, even though I know it may seem a bit silly. One of my favorite things to do is get up a little earlier than everyone else and creep into the kitchen to make the first cup of coffee in my special cup, then go sit down in the sun room and look out to the trees in the back yard. It is a little ritual that helps to center me, kind of like taking a deep calming breath before the day begins. I don’t get to do that very often though because my Katy (who has informed us that from here on out she is to be called by her first and middle name of “Katy Rose”) – excuse me, my Katy Rose is an even earlier riser than her Mama. Some mornings I get my coffee made and get ready to head out into the sun room and a little curly headed pixie pops into the kitchen, so I turn around and head to the recliner instead where she will curl up in my lap and let me stroke her hair while we talk about her dreams. And that’s a pretty good way to start the day, too. I have one rule in my house about mornings, I don’t care how early you get up as long as you wake up happy. I don’t think this is very difficult to do, either, so I’m pretty serious about enforcing it. I have made my kids go back into their rooms when they emerge with sour faces and turn around and come back out again with a smile (surprisingly, it works!). And to make your day a little brighter, here is a fuss free, economical, and delicious beef stew to warm you from the inside out. I just love stew weather! I decided to bring this stew to you using ground beef because it is so economical and most of us have it on hand. This stew is incredibly flavorful and easily adapted to what you have in your pantry and freezer. I have one special ingredient that I do hope you’ll try though, and that is Spicy Hot V-8 juice. It is what gives my stew such a full bodied flavor without me having to cook it all day and add a gazillion different spices. Don’t worry though, it doesn’t make it hot at all – I promise! Have you ever had the beef stew from Cracker Barrel? To me, beef stew made with this spicy V-8 tastes a lot like that. I used to have to buy a big old bottle of this juice whenever I needed some but this time I found a six pack of cans, which makes a lot more sense if you are going to put it in your pantry to cook with. If you see a generic spicy hot vegetable juice, that will work just fine (y’all know I love generics). 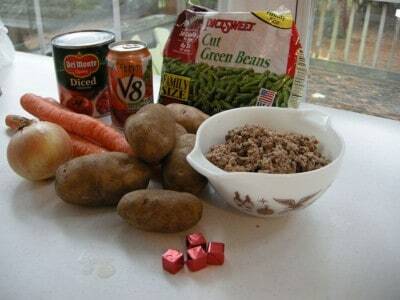 You’ll need: Potatoes, Carrots, Onions, Diced tomatoes, Green Beans, Beef Bouillon Cubes,Ground Beef, and 1-2 cans of Spicy Hot V-8 juice. You can use beef broth in place of the bouillon cubes but I prefer them because they are less expensive and take up less space when storing them (a small container makes about as much broth as twenty five cans of beef broth). 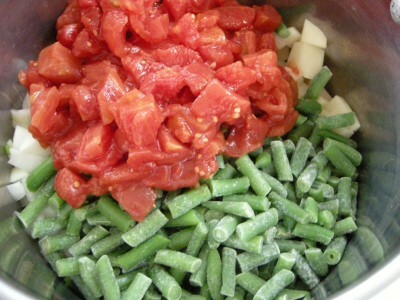 You can also substitute some other bean of your preference for the green beans or add any number of other vegetables. Stews are great to tweak and really make them your own. Play! have fun! Peel and dice your carrots, potatoes, and onion. Place in a large pot. 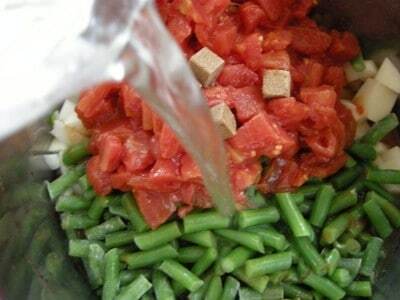 Add can of tomatoes and bag of frozen green beans. Add four bouillon cubes and two cups of water. Add in your Spicy Hot V-8 juice. I am using two cans in mine but you can use one and taste it to see if you want to use the second. I used two and it still wasn’t hot, just very flavorful. Bring this to a boil and then reduce heat and cover and simmer for an hour or so, until vegetables are tender. My beef is already browned and waiting happily for me in the freezer to save making another mess. To see how I process large quantities of ground beef with ease, click here. 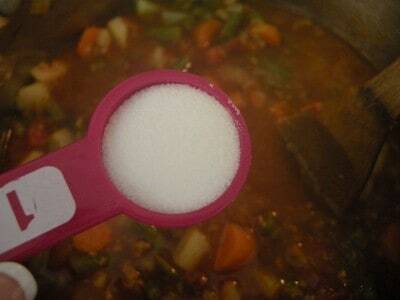 Stir in a teaspoon of salt. You won’t need any pepper because of the V-8 juice but you should salt it to your personal taste. I like to salt it shortly before serving because that gives me a chance to taste the finished product and see about how much it needs. Serve with crackers or cornbread. 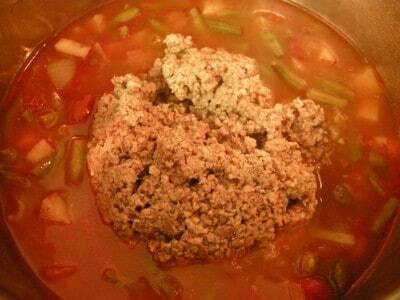 Place everything in a pot except for ground beef. Bring to a boil and reduce heat to simmering. Cover and cook for an hour until vegetables are tender. Add ground beef, cook for another thirty minutes. *This can be assembled in the morning and put in your slow cooker all day on low. If doing it this way, just go ahead and add the ground beef in at the start. I add it in last to keep it a little firmer. Submitted by Judy. To submit your quote, click here. Ohhhhhh….am I the first to comment? This looks great! Thanks for sharing! oh, let it be meeeeee. My Dad’s favorite soup/stew/icecream bowl was a Pyrex bowl exactly like your Granddaddy’s bowl – just a different pattern! After my dad died, I kept the bowl, it had real sentimental value to me. Sadly, a few years later it got broken but I saved the biggest piece and still have it today in the bottom of my jewelry box. It brings up a wave of warm fuzzy feelings whenever I take it out & look at it. Amazing how such simple things can mean more to us than any amount of money or jewels! 🙂 I’m going to try your Ground Beef Stew – it looks yummy – just the type of dish my Dad would have loved to eat – out of his favorite bowl! Just in time for a little cool snap next week! Well, as cool as Alabama gets, I guess. Thanks for sharing! This looks yummy! Girl I make my veggie soup the exact same way, except I use the largest V8 juice can and its regular, but I don’t add water, but I use canned veggies and I use the liquids out of that and it is soooo yummy! I actually made this the other day when my hubby got sick. It made him feel better too! hehehe…a good wife know’s how to make the hubs feel better! Talk to ya later. Hope u have a good day! I can’t wait to try this one!! Yum!! Now on with my comment. Oh that stew looks really good. We have a few of those pyrex bowls that we enjoy our soups and stews out of (try the chicken stew)it is yummy. I have also found several in the goodwill store and being at such a great price of .99 I couldn’t pass it up and now my oldest girl child has her own soup/stew bowls. I’ve never tried the spicy V-8 in my soups, I’ve always just used regular. 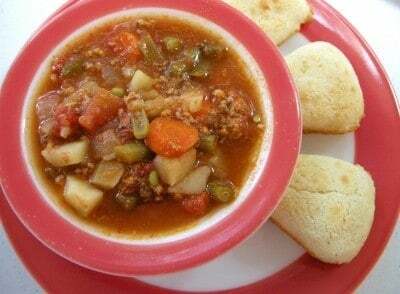 In fact, this is almost exactly like the hamburger soup my mom used to make..
That looks so good! Cool weather is threatening to settle in and I love to cook winter recipes; they are so warm and satisfying. I’m going to fix this one in the crock pot very soon. Thank you! aww, Robin, here’s a grandma hug for you baby. how precious that you saved that wonderful memory. I was a thrift store the other day and was perusing the china and glassware seeking Franciscan and Pyrex of course. My daddy always drank his coffee from one of those old Buffalo dinerware coffee mugs, they weighed a ton and kept your coffee hot forever. I have RA and can’t lift a heavy cup so I didn’t buy it. I wish I had now. Christy honey I am so proud for your achievement. am going to try this one day next week for the crew, it sounds scrumptious. Yall enjoy this early fall weather! Blessings from Beautiful Dallas! I still make a kettle of it up but sure am going to try adding the V-8 to it. Do you thicken your stew? I grew up with a stew that much more of a gravy consistency, if it wasn’t thickened it was vegetable-beef soup. Maybe that was just what my Mother did. Also we rarely had actual beef stew—-most of the time every available head of cattle had to be sold to make the farm payment. So despite living on a farm, we bought meat and that consisted of hamburger because you could stretch that easier for a family of six. We also had meatless meals a fair amount. I mentioned making hamburger stew to a girlfriend one day and she wanted to know what that was. She had never heard of hamburger stew. The funny part of this is she is always talking about how hard up their family of five was when she was a kid, but they always had “beef” stew, and every meal was based on the meat of the day, and the menu planned around the meat. When she gets to talking like that I sit here and think it must be nice to be that hard up. lol. Most of the farmers that we knew back in the 40s-50s were quite hard up, because in the area of SD that I grew up, there were a lot of years that we had poor crops, lots of hail storms. I will have to try using the V-8 in stew for something different. I will have to use the low-sodium, if the spicy comes in that form. 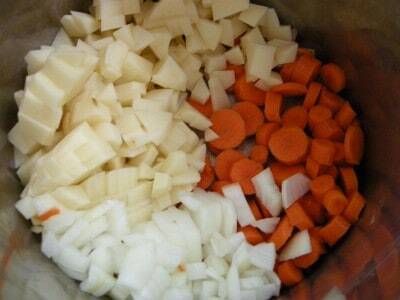 When I make stew, I use canned potatoes and carrots, because every now and then I get them in the senior citizen commodities that I receive every month and I let them accumulate until I have enough to make a big pot of stew. My shoulders are bad and it is hard for me to peel and cut potatoes and carrots. I also never do any thing with sweet potatoes for the same reason, because I always thought the raw ones were hard to peel and cut. Hey! Sometimes I thicken it, sometimes I don’t. A GREAT way to thicken stew though is to add a few spoonfuls of instant mashed potato flakes. I keep them around just for this reason! You’ll get that nice thick sauce you want that way. Those frozen diced hash browns work really well for potatoes in soup also. I know what you mean about peeling and such. My hands don’t like that so much at times, either. Whenever Mama peeled raw sweet potatoes she always had to peel twice as many because I’d be right there eating the raw slices right out of the pot!!! The only thing I would ad is corn-I love corn. I fully understand the satisfaction of eating certain things from a special bowl or your favorite beverage in your own chosen cup. Familiarity means comfort.I always had a Pyrex brown mixing bowl that was just the right size for chocolate pudding and to this day my grown sons refer to it as the chocolate pudding bowl. I LOVE corn myself! I tend to go a little crazy with it. I always add at least double the amount a recipe calls for, lol. Your bowl sounds like “Americana”. Does it have an eagle somewhere in the pattern? I make mine almost the same way except I use a bag of frozen mixed veggies in place of the frozen green beans and fresh carrots. I also add a packet of onion soup mix for some added umph. Now I’m seriously needing a bowl of this yummy comfort food lol. The weather forecast says cool weather for Northern Illinois next week, so this will be perfect! I would never choose to use anything labelled “Spicy Hot”, but I’ll take your word for it and give it a try. 🙂 It looks yummy! Is there anything better than a bowl of homemade soup/stew and a fresh from the oven bread to make the perfect supper on a crisp evening? Not in my house there isn’t! I love these kinds of suppers especially in the cool Fall and Winter days. And it always smells sooooo good while it’s simmering away. Thanks for the reminder and the recipe. Congratulations on your invitation to speak and tour the university facilities Christy! I’ll have to try this one. Let Miss Katy know that I think she is true to her roots. Wanting to be “Katy Rose” just sounds so Southern. We call our daughter by her first and middle names too. She is three and if you call her by just her first name, she will correct you in a minute! Oh you found my secret! LOL My Mom and I make a Weight Watcher soup just like this without the meat. You know that diet thing doesn’t last so we like to make it with the hamburger meat too. LOL I like to add kidney beans to it too. 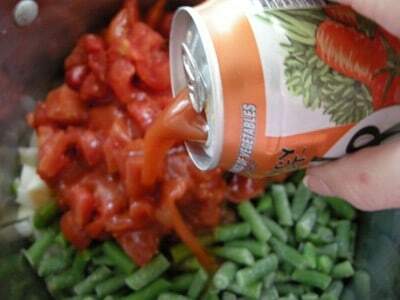 I just do a bunch of can veggies. Anything you wnat. Oh and I have this one bowl that hubby and I tiff over who gets to use it. WE had 2 but one broke! It is a fiesta type bowl. 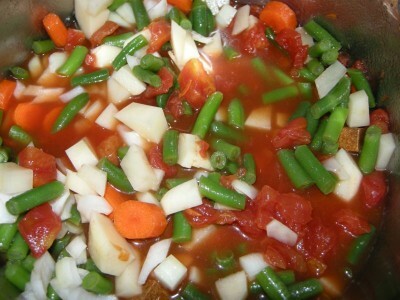 Vickie, I’m with you this is how I make my vegetable soup with this same receipe, have been making it for 51 years the only thing I do different is I add more different veggies, depending on my mood at the time of making. Some of the different veggie’s I use are okra, corn, cabbage, peas, green limas and elbow macaroni. I just always thought that stew has a thicker gravy like mix and soup thinner…but it doesn’t matter the taste is all that counts! I made the fudge yesterday, used peanut butter chips and my husband is a very happy camper…loved it…it’s wonderful…got to be careful though I’ve lost 10 pounds don’t want to gain it back..haha! You go girl your great, everything I’ve tried is wonderful and that’s a complement from am old lady! Chicken Stew and Crunchy Beef Casserole are great #1’s. Oh yea, the hamburgers were great last night!!!! I’m on a roll…….. This looks really good! We even had nicer weather here in Texas so this weekend would be a great Beef Stew weekend. I’m enjoying your page on Facebook also!! Have a great weekend. My hubby makes something very familiar to this but I know he just adds tomato juice, I’m definitely going to suggest the spicy V-8 to him. I had no idea about the frozen potatoes either usually we do use a frozen mixed vegetable blend but there are never enough potatoes for my liking lol. I wish it was hot here in SD, it has been the chilliest summer that I can remember, since I was old enough to remember, out mof my 69 years. I was just looking in the new edition of The Old Farmers Almanac and it sounds like the winter is supposed to be cold too, and next summer cooler than normal too. If I weren’t so old I would seriously consider moving somewhat more south. 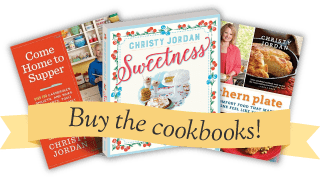 We live in our motorhome and I’m always looking for ways to save room – especially since I love to cook! This stew seems to be something my DH will really love. I checked out your ground beef cooking page and it was one of those OMG moments – why didn’t I ever think of that!! I just love your blog & RSS it every day. Ah, V-8 has been my secret ingredient in beef stew for years. It adds so much flavor and people don’t understand where it’s coming from. Love it! MmmmmMmmmmm good is all I can say! I make mine the same way but add the corn as well. I absolutely can. not. eat. mine. without. cornbread! You cook so much like I do, guess it is that southern bred thing. I enjoy your blog so much. You are so down to earth and inspirational. Isn’t it amazing that as different as people are, food brings them together! I don’t like V-8 or buttermilk to drink, but by golly I will cook with them. Hubby has been hinting for stew, and like Brittany, it is just too hot here in AZ for me to make stew, but I am guessing that this recipe will be what he gets when it does cool off some. Congrats on your talk, you are amazing and should share your knowledge with the younger generation. Thanks once again for an amazing recipe.